The narrative is quite familiar. Schools are failing therefore we need to do something. Education, however, is quite complicated and results from interventions often take time to materialize. On the other hand, it is likewise necessary to know if the interventions are not working or even worse, contributing more to the problems. In this regard, sound data and statistical analysis is urgently needed. One study from Rhode Island is one example. The state of Rhode Island decided to identify and categorize its schools acoording to student performance. Based on this categorization, schools are then mandated to implement interventions. Two years have passed and the study finds, "...schools required to implement few interventions performed no differently relative to schools that had no interventions required. Among lower-performing schools, those required to adopt more interventions did worse than schools mandated to implement fewer, including higher student mobility." 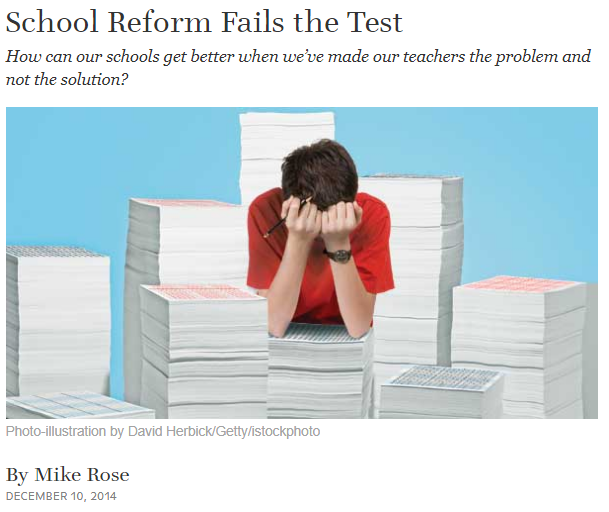 Reforms should begin with these assumptions: "at least some of the answers for improvement were in the public schools themselves, that significant unrealized capacity exists in the teaching force, that even poorly performing schools employ teachers who work to the point of exhaustion to benefit their students?" "Teachers should read, write and think together"
Effects of poverty must be acknowledged. Sadly, most educational reforms do not begin with the above. It is time to change our perspective, otherwise, we will simply continue failing.